I decided to tackle Spawn as a case study, partially because it is a relatively recent creative "property" with a rather interesting public history, and partially because it is a "hot-button" topic. Just taking a quick glance over the number of views and replies per topic here at the Creators Rights forum, shows that this, by far, has had the greatest mass interest. For the purpose of this discussion I think it best to leave all legality aside, and instead focus strictly on moral rights as they would exist in an idealistic world, as I, personally, am really not interested in getting caught up in a discussion about legal technicalities that would be better left for the lawyers to debate. Instead, if we focus our efforts on the moral ideal, we can then back-track and build up the legal aspects around the moral framework. The beginning of the creative stream, so far as I can tell; Spawn is an amalgam of Spider-Man and Batman, "with enough supernatural elements thrown in to be edgy". Under the assumption that being "inspired by" or even "doing a parody of" does not constitute the moral obligation of co-ownership with the owner of the seminal concept, Spawn would be considered a Creative Sourced Work 2)ii) Auteur - sole creator. But for the sake of discussion, let's consider the Creative Stream as being pure. There is only one inlet at this point to the Spawn Comic Book River. Now, is this something that would be considered part of "The Means" portion of the Manifesto? As Malibu was acting as simply a service provider, they don’t qualify for a "cut" of the creative property, or claim their stake in the creative stream. Would this be correct? What stake does the publisher-of-record have, or should have, at this point? With Spawn #1, there are additional collaborators entering the creative mix. In looking over these numbers, and in trying to break down the rest of this analysis, it seems to me there is a distinction between IDEAS, and LABOUR. Not sure if this is what Dave had in mind when he wrote THE SOURCE, and THE WORK, but it does seem to fall into those categories. Where the IDEAS are the concepts, designs, story elements, characters, logos, etc. The LABOUR is the divvying of the manual work involved, such as writing, drawing, inking, colouring, lettering etc. A fair division of profits could possibly be 10% for IDEAS, and 90% for LABOUR. THE SOURCE - Getting ideas. THE WORK - Actual labour in producing the content. THE AUDIENCE – uh, not sure how this one applies... Dave? Editor: Wanda Kolomyjec - ? Does your editor get a creative cut? What about your wife? Your wife-editor? In this case my inclination is to say no. 1. If you are not being paid for your contribution to the creative work - you default to owning a percentage of profit based on the above. Even if you are being paid 100K for a script, that is irrelevant. These default terms should still apply unless otherwise negotiated away. If the contributor chooses to wave these rights, that's certainly the contributor's prerogative. Therefore, in the case of Spawn, it could be argued that for the individual issues fall under term 2. while the reprints contained in the collections would revert to 1. Meaning that every time Spawn 1 is reprinted, he cuts a check to Tom Orzechowski for 15 % of the profit, and Reuben Rude / Steve Oliff for 15 % of the profit. It seems as though this character has gone the same route as Cerebus, where both owners (in this case Rob and Todd) are free to do what they please with Overtkill, by creating their own stories, and toys etc. with the character. I'd be curious to know if Rob makes any money off the Overtkill toys, or if he is simply allowed to make his own toys with the character if he chooses to. 1 – Default option. Every time character is used, he is entitled to 50 % of the 10 % creative cut on all Overtkill merchandise. So 5 % of all the toy profit, etc. 2 - The option to opt - out (as in the case of Larsen and the Spawn redesign - see below).Todd is free to use character with no compensation to Liefeld (and vice versa). So, if the script revolves around Overtkill, and makes up say 80% of the total story, and page count, then Rob would be entitled to 50% of that 80%, and the overall CONCEPT IDEA is worth 10% of THE WORK, the Rob should get 4% of the profit from Spawn 6 and Spawn 7. Meaning Rob would get two checks for approximately $31200.00 (rough estimate assuming 1 million print run). In looking at these cases, I’m seeing that there is a weird osmosis that happens when ideas become interlocked. They are metamorphosed into something new. The upstream of the Comic Book River gets contaminated, and you can’t easily decontaminate it further down the stream without going through a whole process. And even then, there are bound to be trace elements found in the end. How could there not? So in entering a creative collaboration, this has to be taken as a given. If Chapel meets Spawn, then he becomes a part of the Spawn mythos. If Angela meets Spawn, then she becomes a part of the Spawn mythos. If Cerebus meets Spawn, then he becomes a part of the Spawn mythos. 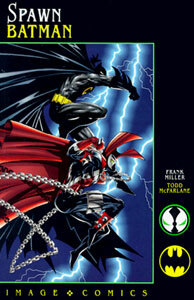 If Batman meets Spawn, then he becomes a part of the Spawn mythos. Now, the more I think about this issue the more I wonder: What if Neil just decided to do his own stories with the Angela character. This seems to be the most ethical solution to the drama that occurred over Spawn 9. If Neil exercised his rights to the character by creating a short story, a mini-comic or vanity press novel, or (since he is Neil Gaiman) having an Angela novel published through a major book publisher... etc. I wonder if there would have even been a problem. Also, Neil could say this is only a one shot deal, these concepts are never again to appear in the pages of Spawn, and that would be the agreement. It's then up to Todd to decide if he wants to include Angela™ as an integral part of the Spawn Comic Book River. Decide at the outset if this is a one off deal. However, according to the concepts presented here, Neil should be entitled to 50 percent of the creative cut on all subsequent printings, appearances, toys, movies, etc. of the creative content he provided to the Creative Stream in Spawn 9. Steve Bissette - "Whatever the 'deal' -- and that's what remains the point of contention, publicly and privately, over a decade later, as it was apparently verbal and there was no piece of paper or contract or written agreement -- Todd promised an equitable share of each respective issues profits to each of the participants. Neil's SHARE (not payment for ideas, not script fee, Neil's SHARE OF PROFITS) was in the vicinity of Dave's SHARE of his issue -- $100,000 being the figure bandied about here." Dave said: "1. 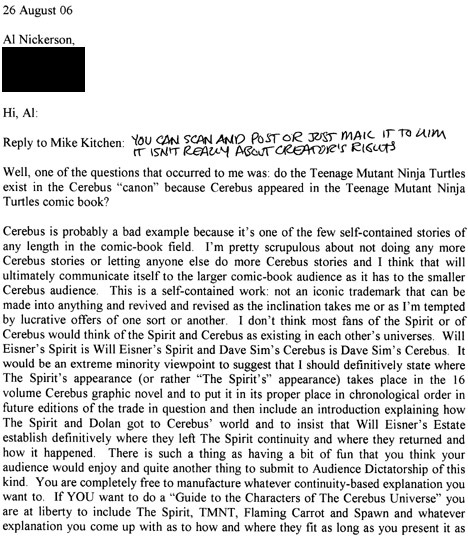 Anything that you create Todd owns outright in exchange for the $100,000 he paid you for the story (my perception)"
I would be interested to know what could be the implications if Cerebus had continued to appear in the Spawn continuity. Example: If "Spawn Dreams" containing Cerebus became a reoccurring feature. Cerebus is now a part of the Spawn continuity. So the question becomes; how do you preserve the artistic integrity of your own story/property once a foreign character is introduced. What if Cerebus showed up in the Spawn movie, in a "Spawn Dreams" segment. What if Cerebus showed up doing kung-fu and saying "Cowabunga!" For instance, if Todd decides he wants to do a toy line replicating the cover for Spawn 10 - how can he do it WITHOUT doing a toy of Cerebus? And if he can't do a toy of his own comic cover, what does THAT say for creator's rights? Curious as to Dave's (and Todd's) thoughts on this. I suppose with a template agreement upfront, the rights regarding merchandise, film rights, etc. could be immediately nixed, allowing the author (in this case Todd) to decide if he wanted to make the commitment to writing this character into a vital moment of the story he's telling. But the fact of the matter is that Cerebus is now a part of the Spawn mythos. To document Spawn’s story, you can’t ignore the fact that Cerebus is a part of it. Chapel is introduced as Al Simmons' killer. Now, once you introduce another creators character into your own story's continuity - especially introducing that character into your characters ORIGIN, how do you deal with that further down the line. I find this even more interesting than the Angela thing. Again, I'm thinking the Dave approach is probably the best approach (assuming I am interpreting it correctly). Where each creator should be able to use each character in the future, in the context of how it was used at the original point where the Creative Streams crossed. Now, what if Todd wanted to do a story where Spawn kills Chapel (or permanently maim him as happened in the story) etc. Do the creative streams separate (again, much in the same way Dave described where Gerhard would have been free to create his OWN Cerebus comic, had he chosen to do so), leaving the public to decide which streams to follow? This seems to be the only ethical approach. By doing this integration of another character into your characters origin, you are basically locking yourself in to a strange sort of marriage between the two creative properties. And could potentially be looking at an ugly divorce if there is ever a falling out between the creators. I suppose, if you write yourself into a corner, you can always write yourself out. In fact many writers say you can get your best stuff by doing so. Now in this case, was Todd involved at all in the creation of the Redeemer? Aside, of course, from the creation of Jason Wynn. So in this case, anytime the Redeemer appears in future issues (or toys) the bulk of the creative cut should go directly to Grant and Greg. Meaning they should see almost 10% of the profit derived from the Redeemer. Introducing a character owned by DC / Time-Warner. I always thought it was an interesting thing that happened with the batarang being lodged in Spawns face at the end. The Spawn face with the shoe lace thing continued the gag in issue 21 and re-occurred through out the series. So what happens in a later issue if a bum asks Spawn "hey man, what happened to your face? ", can Spawn say "oh, Batman did that to me" or does Todd get sued if he writes it that way. Again, artistic integrity to the story, would say that Todd should have the freedom to do so if he wished at this point. If you are writing a story, ethically speaking, should the creator be constrained to these sorts of legal technicalities, or should the creator have the complete artistic and creative freedom to follow up on these story elements (which have already been introduced) in whichever way they see as being best for the overall story they are telling? Now that the art is collaborative, Greg should be now be able to exercise his right of “owning” his portion of the Spawn art. If his pencils are on the page, he should have the right to reprint it. Now, assuming that Erik’s suggestion was worth (what?) maybe 8% of the design, then he should receive 8% of the 10% total of the creative cut (for a total of 0.8%). So if the Spawn action figures earn $100,000, Erik could see a check for $800. In the comic books, if Spawn is worth 5% of the overall design/content contained in those pages, Erik should get 0.04% of the total comic profit. So if the comic makes $10,000 an issue, Erik could see a $4.00 check for his creative contribution of his design suggestion being used. With more guest writing, and guest drawing, Spawn is at a point where there are now many different inlets to the Spawn Comic Book River. It is no longer a pure creative stream, from the artist to his creation. It is contaminated (for better or for worse) with the ideas, and concepts, and designs, and art from many different collaborators. Which in and of itself is neither a good thing, nor a bad thing. Many creative properties have benefited greatly from the creative input others have offered. However with the ideas put forth by the Creative Manifesto II, we should be able to chart the creative stream, and to insure that the collaborators who have helped to build the story receive the compensation they deserve. To strip mine creativity without reimbursement of any kind, simply amounts to capitalistic plunder. Here's a link to Dave Sim's Creative Manifesto 2. If "IDEAS" refers to the creation of the characters and property (which I’m sure it does), then I think 10% of the profits might be a bit low. I guess here in the case of SPAWN, we are suggesting how much of a profit Todd McFarlane should make when he hires others to work on something he created (SPAWN); Todd does nothing while other creators are keeping his comic going (which is an idea I really hate). I know I get frustrated when thinking about Todd McFarlane no longer working on his comic and hiring other creators to produce his book. Still, 10% still seems like a small percentage to me. I can’t help but think of Hollywood in regards to this. I’ve dealt with Hollywood before. It seems like Hollywood’s policy is to throw pocket change to creators who come up with ideas for them, and then Hollywood goes off to do what they want with the creation (Intellectual Property) without any further input from the creator. Sorry… I just strayed a bit there. I went back in to edit my previous post. Cleaned up some formating, and added some pics. You might be right. I wasn't sure what a good number for the creative cut would be for IDEAS. My first thought was that 10% seemed a bit low too, until I realized that if that number got TOO high, the creators that are actually producing the ART would be getting less, which isn't such a good thing. And I also think a low creative cut might actually encourage an artist to stick around and maybe produce some ART on their own creation. I'm with you in regards to the Todd and Spawn thing. So I decided to err on the side of the artists doing the work. Of course that 10% is totally debatable. The main thing is, I wanted to throw out a number and see what people think. So really it's there to act as a discussion starter more than anything. Below is a recent letter from Dave Sim where he addresses the above comments. I also posted Dave's letter here. Well, I’m back again and let me again apologize for my long absence from these discussions. Well, I think this is good. As Mike says even though the percentages aren’t carved in stone, they at least provide a guideline. THE SOURCE I see as being the idea itself, not "getting ideas" or the person who came up with the idea. I see the distinction as being important because the core of the argument when these things fall into dispute is who came up with what? And as Steve and Rick can attest from their experiences back in Mirage and Tundra’s respective hey-days, it’s amazing how fast everyone forgets how an idea evolved from a "pre-idea" state to a full-fledged concept, particularly if people are just brain-storming ideas at dinner or at a party or something. I’m going to seem like a real party-pooper, but I’m going to advocate that all communication of intellectual ideas be "on paper" or via e-mail. That way there’s a paper trail that can be followed back when determining who contributed to what and to what degree. If Siegel and Shuster had insisted that all dealings on Superman be by correspondence—even with each other—then there would be a firm and inviolate record of how the whole thing came about, who came up with what, what they understood to be their situation, what they were putting on the table and what Liebowitz was putting on the table. If an editor or publisher looks at an idea and says they’d like to discuss it with you, in order to protect yourself and them, you are going to be better served by saying, "Please send me a letter a fax or an e-mail" and make sure you retain all records of all discussions. Again, this isn’t carved in stone but if it became standard practice there would be a lot fewer problems caused later on. I would suggest that this is all "Story" considerations and that therefore the participants would start with the arbitrary 32.5% for Story and using the paper trail of discussions of the Idea which is The Source, arrive at a fair percentage. If the essence of the concept or character consists of a dozen definable elements, mutually agreed by the parties as making up the essence of the concept or character and creator A came up with 8 of them and creator B came up with 4 of them, then that would be reflected in what share each would get of the Story money and then later on what share each would get of, say, an advance for a movie. How many of the twelve concepts are being used in the movie? If there are six of them, 2 of the 8 that creator A came up with and all 4 of the 4 creator B came up with, then the revenue split would be different on the movie than on the comic book. But you only have a basis for this if you have a paper trail and you only have a paper trail if you conduct all discussions on paper because otherwise it is practically a guarantee that one or both (or all three) collaborators are going to forget who came up with a key concept. If Steve Bissette can give us a few illustrations from the brainstorming sessions for the Turtles movies that he was privy to, you’ll see what I mean, I think. It is only when all communication is on paper that you have irrefutable evidence that, if necessary, a lawyer or a court of law can dissect and bisect and reduce to its component elements in determining who is entitled to what. Without it, the whole thing becomes "he said, she said". Spawn isn’t the best example, nor is Overtkill, in my view because the creation of both, so far as we know was individual in nature. So far as we know, no one sat down and brain-stormed ideas with Todd. THE SOURCE in Spawn’s case is Todd’s idea for Spawn and no one is disputing Todd as Auteur, sole proprietor. THE WORK I see as being the physical manifestation of the SOURCE, the idea. It can probably be broken down into PRE-WORK and WORK. "Pre-work" would consist of every physical act of creativity that goes into producing the original artwork from which the WORK is reproduced. PRE-WORK would consist of sketches, story outlines, plot synopses, rough drafts, finished drafts, model sheets, pencilled pages, etc.—anything that isn’t the finished pages which are going to be reproduced but which goes into the process of creating those finished pages. There is some crossover between THE SOURCE and THE WORK which is why I advocate that the paper trail be maintained. If the paper trail ends once the collaboration begins and one guy is going over to the other guy’s house with thumbnails and they’re going over them and just bouncing ideas around it is almost certain that someone’s contribution is going to get permanently misplaced or misappropriated through no fault except faulty memories. When the give and take is on paper, then you know who contributed what at each stage because you never know when a key idea is going to be introduced. "At that point either Kevin or I said, I forget which…". If all communication is on paper or e-mail you can backtrack and see right away. This is perhaps even more important when it comes to a CREATOR/EDITOR dialogue. The Creator presents his idea(s) they bat them around and the Editor makes three major changes in the nature of the property. If the Creator decides to take his property elsewhere, you have a paper trail saying that the Editor contributed these three ideas. If the ideas have become a core part of the character/concept the Creator has the option of doing an idea-ectomy and walking away clean with what he came in with or compensating the editor or the Company for his/its contribution on an on-going basis. 2) THE WORK which is the finished product/pages which are ready to be reproduced which is made up of a) THE SOURCE combined with b) the Two aspects of PRE-WORK brought to finished incarnation AND whose raw material state is also the physical property of those who produced it divided in some agreed upon fashion (penciller gets so many pages and first pick, inker gets so many pages, writer gets so many pages if they agree on that ahead of time). 3) POST-WORK is the collective and individual reproductions of THE WORK which are the actual commercially transacted elements and element respectively. You sell the print run of comic books and you sell each individual comic book in that print run and that’s the primary source of revenue. The raw material state, the original pages, can arguably be described as part of THE WORK or part of THE POST WORK (or even the POST POST WORK). It is only part of THE WORK before it is reproduced, at the point where it is the sole physical incarnation of THE SOURCE in tandem with the two aspects of PRE-WORK brought to finished form. Once it has been photographed or scanned and negatives made of it, arguably it goes from being THE raw material to A by-product. The scan or the negative takes its place as THE raw material and it is no longer needed to bring about the POST WORK state of multiple reproductions and its state changes from MEANS to END. It is the physical property of the creators to own or sell completely apart from its previous role as THE WORK brought to finished form and apart from its function as the MEANS of producing the POST WORK. THE MEANS includes everything that is needed to bring about the POST WORK state of multiple reproductions. It includes PUBLISHING and PRINTING and DISTRIBUTION, that is, all necessary MEANS to transform the single physical incarnation of THE SOURCE into a POST WORK state of multiple copies transacted collectively and individually. It can be anything from a photocopier to a laser jet printer to a 12 colour offset press. It can also be a website. If you post your strip to your website, taking it from the single incarnation state it had on the drawing board or on your computer screen, you facilitate PUBLISHING it in the sense that everyone who downloads your strip is engaged in producing their own copy of it on their own computer screen. The Internet is the only environment I know of where PUBLISHING and PRINTING are accomplished at least partly by the audience. THE MEANS can but does not necessarily include participation in THE SOURCE and THE WORK. Work-made-for-hire is an example where THE MEANS of dissemination (say DC or Marvel) is deemed to be THE SOURCE by virtue of THE SOURCE having conveyed all legal claims to be THE SOURCE to THE MEANS. Image’s deal where they are entitled to a fixed percentage of revenues in perpetuity would be one step removed from that: a PARTICIPATORY MEANS rather than a SUPPLANTING MEANS. They don’t take your place as THE SOURCE but they do become a CO-SOURCE in perpetuity. It’s important to understand where the overlap occurs at the outset and to keep the elements separate. That is, if you are moving from SOURCE STATE to PRE-WORK at the same time that you are negotiating what MEANS you intend to enter into legal agreement with, it is important I think to have separate and complete paper trails for both. If all of your communications are on paper and documented then you can establish LEGAL INTENT if it becomes necessary and this needs to be established at the outset i.e. "I am entering into negotiation with MEANS X both in moving from the SOURCE STATE to the PRE-WORK state in terms of THE WORK and from THE SOLE SOURCE STATE to the PARTICIPATORY MEANS or SUPPLANTING MEANS state in terms of THE MEANS but both are in the discusson phase. My sole intent is to explore possibilities and on-going negotiations should not be deemed to constitute LEGAL INTENT to consummate a deal. Intent to consummate a deal will be declared in writing if I get to that point." This means that you can explore all of the avenues and potentials and limitations of a proposed deal and be moving the creative work forward without making yourself legally culpable either for any time or money or creative consultation MEANS X expends in proposing terms. THE WORK might be changing in the PRE-WORK phase from a SOLE SOURCE to a SOURCE/PARTICIPATORY MEANS partnership or from a SOLE SOURCE to a SOURCE/SUPPLANTING MEANS partnership (that is, you and your Marvel editor or DC editor are discussing legal business terms and also discussing how to turn your property into their property) but because the paper trail is there with your LEGAL INTENT established at the outset, it is still possible for you to disengage at any point in the discussions and eliminate any contributions made by the other side and return to a SOLE SOURCE state without any legal prejudice. I think this is necessary if the DC clauses governing intent are common, which I’m sure they are. Negotiation is not agreement if you specifically declare at the outset that you are doing one and not the other. If negotiations drag on over months and sometimes years as they have been known to do at the big companies, that can pose a legal hurdle if a court deems that you had already entered into agreement by "collaborating" with an editor in moving from SOURCE STATE to PRE-WORK state or, even worse, from a SOURCE STATE to a WORK state. That is, the comic book is almost done, press time has been scheduled and you have changed your concept in accordance with the dictates of an editor but you haven’t gotten a contract yet and when the contract comes in it doesn’t reflect what you thought had been agreed to. Without a paper trail there’s no way to establish what you had thought had been agreed to and with high-powered corporate legal muscle on the other side of the courtroom, the fact that you had moved so far along in the process could be deemed LEGAL INTENT. With a paper trail you not only have your LEGAL INTENT in writing that you are only negotiating and not agreeing but you also have all of your understandings of what the agreement is going to contain in writing and therefore legal basis for disengaging from the process: bad faith negotiations on the part of the company. In fact at that point the legal balance would tilt in your favour and you could threaten the company with legal action for malfeasance, misrepresentation, attempted fraudulent misappropriation of your property. Don’t be surprised if the only thing the companies commit to paper is their own contract while they want to discuss all of your concerns on the phone where there is no paper trail. "Promise him anything verbally, nothing in writing and get him to sign the contract without any changes." It’s the bait-and-switch. I’m not sure where Mike Kitchen’s ideas of the demarcation between IDEAS and LABOUR come in, but I think they are good ones and I suspect they might be subsets of THE SOURCE and THE WORK respectively. In a situation where there was an absolute division between the two—one person is the IDEAS guy who does nothing creatively after helping create or co-create the character and coming up with the backstory, concepts, bible, logo, etc. [PRE-WORK] and the other person is LABOUR, writer, scripter, penciller, inker, letterer, colorist of the actual WORK then I can see a 10%/90% split as being a reasonable base starting from that one extreme polarized example and then shifting percentages from the latter to the former in a case where IDEAS guy is also the writer (additional 5%) or the writer/scripter (additional 10%) or writer/scripter layout artist (additional 15 to 20%). Whether the editor gets a creative cut/percentage would depend on the extent of their participation, I would think. If they’re just proof-reading or looking for content inconsistencies (the spelling of the name of the character changes from page 5 to page 6), then no. But if they are performing PRE-WORK functions, actively participating in moving from SOURCE STATE to PRE-WORK to WORK, then yes. A good example would be Karen Berger’s participation in changing the content of "A Midsummer Night’s Dream" in that it was her criticism of Neil’s approach that led him to rethink a critical part of the story and to improve it dramatically. I’m not sure that that would entitle her to a cut of Neil’s SOURCE royalty of Sandman overall, but I think it would entitle her to a cut of royalties on the number of pages that "Midsummer’s" takes up in the Dream Country volume. I mean, I could be a real stickler and say she should only get a cut of the page that Neil actually changed with Shakespeare’s son but I think you have to agree that that single page boosted the content of the entire story…and you could probably argue that it kicked the entirety of Dream Country up a notch. I think you just play fair in that case and admit, as Neil has, where editing made an exponential improvement and that the onus is on THE SOURCE to keep track of it scrupulously and to make sure that genuine contributions are compensated adequately. As in the case with Bissette and From Hell (or, for that matter ME and From Hell: as far as I know I paid an advance for the first instalment when we were publishing Taboo), it’s up to Alan and Eddie. If they don’t think Steve was a critical part of getting From Hell rolling and that he isn’t entitled to even a token cheque (and if they think that then I think they’re wrong) from the movie deal then that’s their call. It really requires paying attention in the same way that I TRY to pay attention to sending Bob Burden a cheque whenever we reprint Church & State II but I freely admit that I’ve had to have Gerhard backtrack through the printing history a couple of times to find out if we paid Bob. No malfeasance intended—and I certainly wouldn’t expect Bob to press charges or even to publicize the fact that he didn’t get paid for the latest printing (I’m 99% certain he has no idea when the volume is reprinted)—but an unforgivable breach of ethics in The Buck Stops Here sense for the exact reason that if I don’t keep track of it and actively work to stay current with our cheques to Bob and Rick no one else is going to. I follow Mike’s argument here up to a point but I think there are problems with deeming that as soon as your character appears in another comic book that character becomes part of that book’s Mythos (ie. Cerebus is part of the Spawn Mythos). It seems to me that this where the AUDIENCE comes in: in the same way that it’s now widely accepted in science that an observer affects the nature of an experiment merely by observing it. Todd has chosen not to reprint Spawn 10 for whatever reason. In effect what he is saying is that Cerebus was a one-off event in 1993 in Spawn but his presence in the Spawn Universe has been rescinded. The canonical story jumps from Alan’s issue to Frank’s issue and Dave’s and Neil’s issues don’t exist anymore. It’s not an insensible choice, in my view. Todd pitched the crossover as I could do whatever I wanted, I had complete creative freedom. "If you want to write Spawn sitting on the toilet for 20 pages, that’s up to you." Well, I took him at his word and basically did a story that stretched Spawn continuity to the breaking point and beyond by choosing to ignore 99.9% of continuity (with the one tenuous Levels of Hell connection) and change Todd’s comic book from a Vertigo style super-hero book into a political cartoon for twenty pages . You would really have to stretch a point to see the story as a part of Spawn continuity if Spawn continuity—issue one to the present as a single storyline—is what you’re focusing on. The story makes a lot more sense if you eliminate issue 10 than if you leave issue 10 in. And I would assume that was the reaction of Spawndom Assembled. "Uhhh…let’s just forget that Spawn 10 even existed." Of course, on the other side of the equation I hear frequently that Spawn 10 was the best issue of the title but the people I hear that from are not regular Spawn audience members. So Todd essentially chooses to go with what I assume is the majority view and to just ignore Spawn 10 and the fact that there’s no outcry or protest means that he made the right call in the DMZ between THE SOURCE and THE AUDIENCE. Todd and his readers agree. "Uhhh…let’s just forget that Spawn 10 even existed." All in favour? And the motion passes by a staggering majority vote. The same is true with the relentless process of bringing characters back from the dead at DC and Marvel. Is Supergirl dead or did she never exist or has she been brought back to life? Is she the Supergirl of the animated cartoons or Peter David’s Supergirl or Jim Mooney’s Supergirl? The answer, it seems to me, is whatever you can get away with, whatever THE AUDIENCE will put up with. If you can convince the vast majority of DC readers that all nine or twelve or fifteen Supergirls existed/no longer exist/never did exist/are alive/are dead/were dead and are now alive/have a new name/have the old name but a new look/have a new origin/had a new origin but now have a newer origin and THE AUDIENCE doesn’t feel bamboozled by that, doesn’t feel that DC is snickering at them and going "What an ultra-maroon" then more power to DC. Like Todd they are succeeding in the DMZ between THE SOURCE and THE AUDIENCE. Of course success is a relative term if you compare what Jim Mooney’s Supergirl sold in the back of Action Comics in the 1960s and what the Bruce Timm version or Peter David version is selling today. You can fool all of the people some of the time and some of the people all of the time but you can’t fool all of the people all of the time—and eventually it is going to cost you a big chunk of THE AUDIENCE. Okay, I have quite a bit more mail to answer here, but I think this covers my reaction to Mike’s primary points and maybe helps to move the CREATIVE MANIFESTO along a couple of baby steps. Admittedly Spawn may not be the best example, however for the purpose of this discussion, I thought it would be a good one to start with. Teenage Mutant Ninja Turtles could possibly be far more interesting, except I don’t have access to the sort of information that would be necessary for a proper dissection and analysis. The Spawn creative work is recent enough, and public enough that I thought I could take a proper stab at it. The thing I find interesting with Spawn is how it starts so simple. Sole Proprietor. Then as characters are introduced, and guest writer stories are written, things suddenly get very, very complicated. Which is why I find this an interesting case to test out some ideals. While I agree that Todd is without dispute, Auteur, sole proprietor of Spawn, I still thought it would be worth mentioning the Erik Larsen CBR article on swipes for the purpose of discussion. Basically what Erik was saying is that if an artist swipes another artist’s composition, etc., should the artist they swiped be entitled to compensation. That would have wide reaching implication in the case of other characters being based on other characters. If you followed that logic to the lunatic extreme, Aardvark-Vanehiem would be required to send Marvel a check everytime Wolveroach appeared. TMP would be required to send Marvel and Warner Brothers a check everytime Spawn appeared (assuming he did take the concept of Spider-Man and Batman and merged them). Erik Larsen would be required to send a check to Takaratomy, Paramount and Warner Brothers (Speed Racer, Captain Kirk, and Batman). I would be required to send a check to Warner Brothers, (Police Academy, Spy vs. Spy) anytime I printed Spy Guy (as those are as far as I can tell the seminal concepts that my character was based on). Now, I personally disagree with the concept of swipe compensation as described above. The reason I threw it out there in the first place was for the purpose of discussion. In the case of swipes, I’m personally of the mindset that “imitation is the highest form of flattery” and that if the creator gives credit where credit is due, then that is enough. Compensation would come from people who become intrigued and seek out the “original” – hence creating new admirers of the original artists work. I figured at the very least, the idea of compensation for swipes could be officially nixed from the Manifesto II agenda. As a tangent, if swipes are nixed, how does that relate to the idea of creating Medieval Spawn and Angela? In the case of Overtkill, all documentation clearly indicates the character as being co-created by Liefeld and McFarlane. Now who did what, I couldn’t tell you... in fact, I may attempt to send Rob Liefeld an e-mail to see if he cares to chime in on the discussion. Of all the collaborative works on Spawn, the one I find most interesting is Chapel (even more-so than Angela and Medieval Spawn). The idea of writing another creators character into the origin story of your own character to me is quite mind boggling (but in an interesting way). The implications created by such a simple act, and the repercussions from the professional “divorce” of the two creators is overwhelming. Chapel is the perfect example (more so than my Cerebus example) of my argument that once a character enters another characters universe, the audience can logically deduce that the character now exists (or at the very least – temporarily existed) in that universe. Even if it is an alternate reality version, or a non-canonized version, that version of the character now exists. And it would take a fair amount of retro fitting and decontamination as well as audience hoodwinking, to try and pretend (by rewriting, or letting go out of print or whatever) that the character never existed. For the Spawn movie, Chapel got retrofitted to that movie chick Jessica Priest. At that point you’re re-writing Spawn history. It like attempting artistic time travel, or dimensional shifting. You get a Crisis On Infinite Spawns. Will the audience buy it? And my point is why? Why bother going through that sort of retrofitting of the origin story of your character? Because of the Hollywood lawyers? This is why the idea of this Creative Manifesto is such a good idea to me. Because then you can say “okay – Chapel was created by Rob Liefeld, and Chapel appears in # % of the movie, and makes up # % of the story, so he is entitled to # $ of the creative cut of profit for the Spawn movie. Period.” So when the movie is made, Chapel can stay in. End of discussion. Assuming of course the creators agreed to these terms on the Creative Manifesto II checklist. All I can say for certain is that as an audience member, Chapel killed Spawn. Say if the Turtles 3 movie was based on TMNT #8 (as I am sure it at least partially was). Say Cerebus showed up in the movie, and Dave Sim got his cut of the profit according to the Creative Manifesto II numbers. Would everything be cool? It would be something to think about, if an artist ever decides to cross-over characters with another artist. What happens when their work explodes and turns Hollywood? What do you do? How do you prepare for it? What if you don’t want your contribution to explode and turn Hollywood? You don’t want your contribution to become an action figure? There are enough historical examples on what you can expect, but what is the IDEAL way to handle the situation. 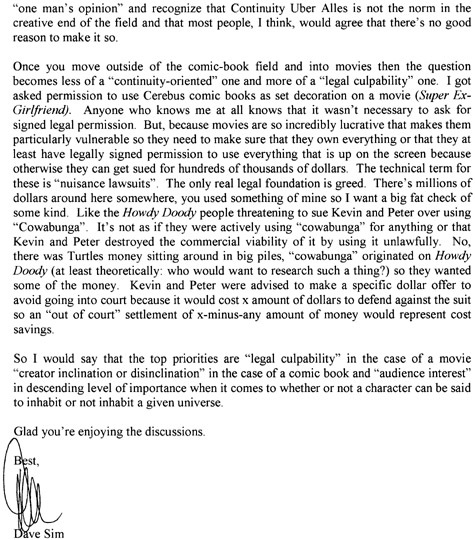 It seems that this would be the case where Dave could have not checked the movie rights on the Creative Manifesto II checklist, and then Kevin and Peter (or Todd McFarlane) could decide if they wanted to continue with the TMNT (or Spawn) Cerebus crossover or not, knowing that they could NEVER use it in a Hollywood (or Toy) production. It seems almost useless to argue in hypotheticals, however I don’t see any other way in continuing the discussion so that can come up with guidelines, or examples in how the Creative Manifesto II would or should operate in the real world without doing so. Seeing as how it hasn’t been done before. The entire thing at this point is purely hypothetical. In the case of Cerebus, what DOES happen to it in a hundred years once it has entered public domain? What about the characters that other creators contributed to the story? I don’t know. But I do think it is worth the discussion. THE AUDIENCE: Is this the role of the audience? There is a symbiotic relationship (for lack of a better word) in that it is the audience support that makes creating a story financially viable to the creator. Though their participation, I would argue, isn’t necessarily required, I do see how they can potentially play a part: “Because you demanded it” type stories. By using their “fan dollars” to vote on story direction. And in extreme cases by seizing control of a project and creating an entirely different version based on their own vision. Star Wars is another perfect example of this, with all of the fan edits that now exist, as well as the fan films. To me, this is two different arguments. On being about comic book “canon” and the other is about comic book “multiple universe”. The canon argument is fine. Even God decided to edit out part of scripture that didn’t make the cut in the Bible. I remember this sort of thing was discussed with Cerebus – and why Dave Sim wouldn’t redo any of the older stories because of this exact reason. George Lucas went around changing the Star Wars canon with the “Han shot first” “no, Greedo shot first” thing. The recent films and releases sort of set him up for having The Audience create their own canon. To me, this canonizing argument is more like throwing an aardvark into the Spawn comic book river. Sure, it wasn’t in there long, and sure maybe The Audience may collectively vote to decide the don’t want an aardvark in their Spawn comic book river. But there is no denying that it WAS there. Not reprinting Spawn 10 doesn’t change this. To me, as an audience member, there are still trace elements of Aardvark in the stream. Though in this case, I suppose it’s a matter of Todd trying to REMOVE trace elements of aardvark from the comic book river. Like installing a big refinery in the stream to remove all trace elements of aardvark. Same goes with Chapel being retrofitted to that movie chick Jessica Priest. At that point you’re re-writing history. Attempting time travel, dimensional shifting. It becomes a crisis on infinite spawns. Will the audience buy it. All I can say for certain is that as an audience member, Chapel killed Spawn. When Spawn dreams, he sees aardvarks. There is a Flaming Carrot on the moon. Han shot first. In the case of the Teen Titans, I prefer the new cartoon version to that of the traditional comic. So that is the one that gets my fan vote as being canon. Assuming the Turtles story in Cerebus is canon. I could imagine in future Cerebus Universe comics, the mercenary army soldiers talking about the little green dudes and the sorceress Renet. If Cerebus was to go to the moon again, (okay, Cerebus is dead now, but say if one of the cerebites were to go to the moon, I as an audience member could expect that there is a Flaming Carrot up there, or at the very least, the corpse of a Flaming Carrot, or barring that, at least give me a good excuse WHY there ISN’T a flaming carrot on the moon). In the case of Cerebus appearing in Spawn: If indeed this issue has been deemed non-canon in the Spawn Mythos as suggested, then that is one thing. Fine. I’ve recently watched a couple of fan edits of Star Wars: A New Hope (Hybrid Edition) , Star Trek V (Phase II), and Matrix: Dezionized. All of which made a drastic improvement to the official studio edits, to the point where I would consider the fan edit cuts of the film as being the official “canon”, and the studio edit cuts as being “non-canon”. What is everyone else’s opinion on this? Taking the conversation back to comics, I thing Dave Sim hits the nail on the head with his Supergirl diatribe. I know that I have my own personal canon list for the Batman mythos, which takes what I consider the best from all the comic books, cartoons, TV series, and feature films. It’s and interesting thing that has been done with the Cerebus Yahoo’s in creating the official Cerebus canon list in the Cerebus Archive Reports. However, all that said. I still stand by my original point (non-canon aside) that once a character enters a universe, it can be assumed that the character exists in that universe. I can’t see how that can NOT be the case in a purely artistic work. For example: If Win-Mill publishing was going to make a “Guide To Characters Of The Cerebus Universe” I would expect to see listings of all characters who made an appearance in the (canonized) Cerebus story. Including: The Spirit, TMNT, Flaming Carrot, etc. Even though these characters were created by other artists, there is, without a doubt, a version of these characters that exist in the Cerebus canonized universe. Of course, that isn’t to say that the entire other universe that belongs to that character necessarily exists in that universe. Whether it is an alternate reality character, or a time travelling character, etc. Example: Batman vs. Predator. I consider this story to be Batman Canon, but don’t consider this story to be Predator Canon. I think the whole topic of Creator’s Rights is a good one, and hope that these discussions continue to develop the foundation for the Creative Manifesto II. Okay. I haven’t properly tied off this post, and I am probably going to go back to proof read this post later and clean some things up – but for now, I’ll just post it as is. Some of these topics could probably be broken off and started as their own threads (to keep this one from becoming bloated with multiple conversation points). I'm still trying to write a response to Dave Sim. Once it's done (this week?) I'll post it as a new topic (since this really isn't about Spawn anymore).